Surprising new findings in STK studies conducted have linked the benefits of tea tree oil with increased vigor and yield in crops, when used in conjunction with Timorex Gold, STK’s botanical-based bio-fungicide. Tea tree oil (TTO) is an essential oil extracted by steam distillation from the leaves of Melaleuca alternifolia, a small tree native to Queensland and New South Wales, Australia. The use of tea tree oil can be traced back to the early Aborigines, who used it as an antimicrobial agent for centuries in their traditional medicine due to its effective antiseptic, fungicide and bactericide properties. STK has recognized the great potential of tea tree oil for plant protection applications and developed a unique natural fungicide, Timorex Gold. Timorex Gold has demonstrated high efficacy against a broad spectrum of plant-pathogenic fungi with strong prophylactic and curative activities in numerous crops, including vegetables, herbs, grapevines, bananas, rice, coffee and fruit trees. 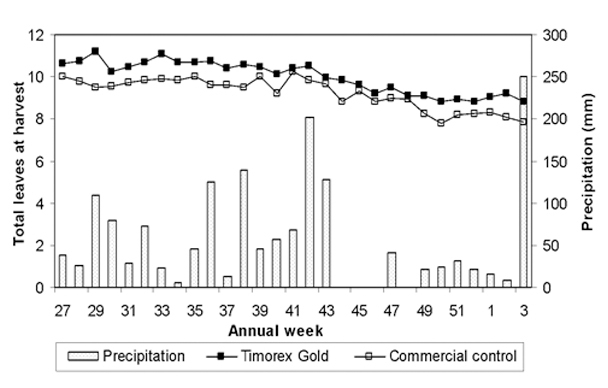 In the last 10 years of experimental and commercial use, Timorex Gold was found to provide a significant added value to existing methods, in addition to its disease control and crop protection efficacy. Can Timorex Gold surpass the efficacy of commercial methods? During its study on the efficacy of Timorex Gold against the Black Sigatoka disease in Central and South America, STK noticed that it also affected the number of healthy functioning leaves in banana plants. Previous studies showed that one additional functional banana leaf at the time of harvest significantly increases banana yield. To further investigate this finding, STK conducted a semi-commercial trial in Belize on Grand Nain cultivars of Cavendish banana plants. 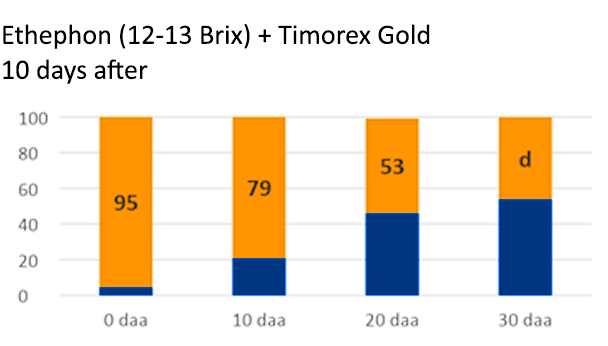 A total of 32 applications of Timorex Gold at 0.5 L/ha were made on a commercial area of 134 ha. The control treatment included conventional chemical compounds such as Mancozeb, chlorothalonil, and systemic fungicides, applied on dates in conjunction with Timorex Gold, used in recommended quantities and sprayed at a total volume of 18.0 L/ha. STK’s research team then conducted a weekly evaluation of disease variables and of the number of healthy functioning leaves on each banana plant for each of the treatments. They also recorded yield parameters such as average bunch weight and average number of hands per bunch. The area treated with Timorex Gold demonstrated efficacy equivalent to the control commercial treatments, as indicated by analyzing the youngest identified leaf, the youngest infected leaf and the AUDPC. However, Timorex Gold surpassed the commercial treatment with the growth of one additional functional leaf (Fig. 1). The larger number of green leaves resulted in heavier bunches (by up to 7%), with more hands (by up to 15%), larger diameter of the apical hand (by up to 10%), and a larger basal diameter (by up to 14%). 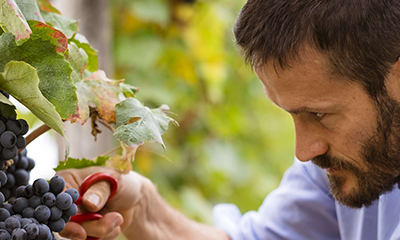 In fieldtrials conducted in Argentina, Chile and Brazil on Red Globe table grapes, STK examined the addition of a single spray of Timorex Gold at 0.5 L/ha following an application of Ethrel 48 SC (ethephone) at 0.5 L/ha. Ethrel was applied in the first application which began with the breaking of color at 12–13o Brix, and then Timorex Gold was applied 10 days later. Comparison treatments included one application of Ethrel 48 SC (ethephone) at 0.5 L/ha and unsprayed vines as a control group. Researchers aimed at documenting the rate of color evolution, and the number of bunches that are good for harvest (Fig. 2). Fig 2. 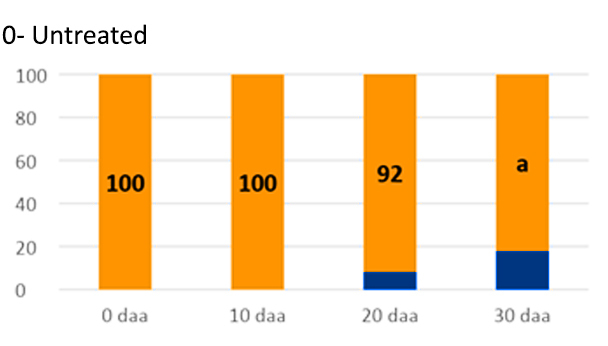 Color change scale: 1=0-25% color, 2=25-75%, 3=75-99% and 4=100%. Note: bunches at grades 3 and 4 are good for harvest. Results showed that the application of Ethephon followed by Timorex Gold resulted in higher percentage of full-colored grapes in the first and second harvest, compared with the standard treatment using Ethephon alone. Timorex Gold also improved color uniformity (Fig. 3) and showed significantly higher percentage of full-colored grapes, compared with the standard treatment of Ethephon alone or the untreated control crops. 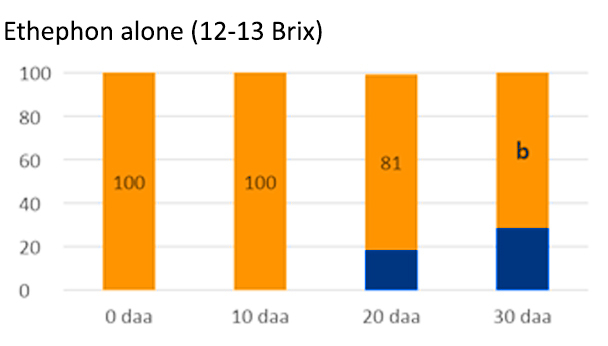 Moreover, adding a Timorex application following Ethephon resulted in a higher average number (up to 49%) of bunches that were good for harvest per plant, compared with Ethephon alone. Similar results were obtained in large scale commercial trials in Chile, Brazil and China. Fig. 3. Effect of Timorex Gold on color change of bunches according to various grade scale described in Fig. 2 where: 1 & 2= up to 75% color and 3 & 4= up to 100% color and good for harvest. The larger number of green leaves in Timorex Gold-treated bananas resulted in heavier bunches and higher yield. For farmers and growers this is nothing but good news – as one more functional leaf at harvest increases banana yield by 1 kg per bunch and the yield of the plantation by 1,700 kg/ha, – an additional 81 boxes/ha. In the case of table grapes, Timorex Gold could be a promising complement to Ethephon for color uniformity by increasing the number of bunches that are good for harvest. Moreover, similar effects on plant growth, yield and quality have been observed in other crops such as rice, peanuts, tomatoes, garlic, carrots, coffee and more. Over the past few decades, increasing concern over the health impacts of chemical residues on plants and on crops has led to a greater demand for organically grown produce. Farmers who have been struggling to protect their crops and to bring healthy produce into the market while still meeting organic standards are on the lookout for new solutions. Pesticides that are based on herbal essential oils, including tea tree oil, may be part of the solution to this problem. STK’s experimental and commercial use of Timorex Gold on Cavendish bananas and table grapes demonstrates that it has not only proven to be effective against a broad spectrum of plant diseases, but is also highly effective at improving yield and fruit quality in agricultural crops.